It is late May and we have been having overcast days that are so cool I have been wearing jeans. On Sunday we had friends over who live in Apple Valley. That is the in the high desert about an hour away. Usually if it is hot here it is hot there, cold here, cold there. However, they do get a little snow in the winter and much less rain than we do. But, when they walked in the door on Sunday I had to laugh. They were wearing summer clothes and Hubby and I were in jeans and tennis shoes! They were having more typical late May weather at their house, quite warm, and they thought we would be having typical May weather at our house. Sorry, no. Mother Nature may have gotten her prescription filled, finally. It warmed up here yesterday and it appears it will be the same today. We have a little haze this morning, but the sun will burn that off soon. I may not like hot weather, but I do like predictable weather. 2016 has not been the year for predictable weather! I think my family is similar to many others in America with a family tree full of people who served in the military and fought in wars to keep our country free. This post is for all of them. For my Dad, who wasn’t quite old enough to serve in WWII, even though he really wanted to. He joined the Navy to see the world. Instead he saw Memphis, Tennessee and a red head who could really cook. He rejoined civilian life, raised a family, and was a wonderful father and community member. For my Uncle Harvey, who went to England in WWII and fixed airplanes, to help keep our men in the skies over Europe. For my Great Uncle John, who went to Europe during WWI, fought, was gassed, and came home to Arkansas. He later died in his 30s because of the damage to his lungs. For my Great Great grandfather Ernest, who fought on the Union side in the Civil War. For my 6th great grandfather John Milner, and my other ancestors who fought in the Revolutionary War. I thank you for your part in the founding of this great country. Warning: This will be a somewhat earthy post! I was cleaning the front bathroom and saw, standing in a discreet (but never discreet enough) place at the rear of the toilet, the ever ubiquitous toilet plunger. I realized that I could take that household workhorse and put it in the garage. Yay! Over the past two or so years we have replaced both toilets in the house with newer models. The old ones were awful, clogging all the time. In the front bathroom in particular we had to keep the plunger at the ready at all times. We have very hard water and the minerals clog up the little openings that allow the water into the toilet, affecting its ability to swirl around and do its job. The minerals probably line the exit pip as well, although I have never investigated that. What ever the case, it makes toilets begin to act badly after about a year of use. Then we bought a Kohler for our back bathroom. It uses 1.6 liters of water or less per flush, so it is very water efficient. Even better, in two years of use, it has only clogged once, and that was totally human error. When we decided to replace the toilet in the front bathroom with a new one, we definitely bought a Kohler. The fellow in the store where we bought it explained that Kohler keeps the same diameter in its exit pipe, even though the bends. He said that helped prevent clogs. I don’t really care what does it, I just know the Kohler toilets work for us. Constant plunging is fading to a bad distant memory. Gosh, that makes me happy! Unfortunately, I did not receive a free new toilet to inspire this post. I bought both my toilets myself. I just like to share with you reviews of products we have found to work for us, in case you need something similar in your household. Just a normal day around here. I am running around with my hair on fire trying to get things done, But I wanted to take a moment to appreciate the nice day. The sun is shining and it should be about 80 degrees today. Lovely! The little lizard doing push ups outside my dining room window made me smile. Nox was being silly, rubbing against the wall and then flopping over. You had to be there, but, take my word for it, it was adorable. Lumos has been talking to me this morning. It is so cute when he does that. He has also been playing fetch with me. So fun to throw the cat toy and see him run after it! Blackie is, right this moment, sitting and looking out the front window. I am just happy he is still around doing his cat thing, being curious about the world. I hope your Friday is going well and that you are going to have a great weekend. We are going wine tasting on Sunday. Yay! Lucky for us, the show is filmed in eastern Los Angeles, which is a lot closer to our home than other parts of LA. It was just under an hour to get there! Whoo hoo! In case you are imagining a sound studio on a film lot, get that right out of your mind! Instead, it was a giant warehouse, shaped like a Quonset hut, in a very rundown industrial kind of area of East LA. Oh, so much for the idea that everything to do with television is glamorous!!! We got to see the filming, the blooopers, the way they whip the crowd into a frenzy…There was lots of screaming for the camera, sometimes during the action, sometimes just for the camera. There weren’t any restaurants in the area so they had food trucks lined up on the street were we could buy food and drinks, thank goodness! They weren’t kidding when they said it would be seven hours, btw. It was almost exactly that amount of time. Hubby and I bathed in the blue BattleBots light. We had a great time. There was some waiting around, but that was OK. It was so intense when the battles were going on, or when they wanted us to cheer for Faruq the announcer, or when we cheered the teams when they arrived with their bots, that it was nice to chill and relax for awhile. I brought magazines, of course, so I was good. Because we knew someone on the crew we got a behind the scenes tour. We got to talk to some of the teams, see the bots up close, see the damage from the fights up close, and just have a good old nerdy time. All in all, it was a fun day, a very different experience, and we enjoyed it as a family, which made it particularly fun! Of course, I won’t reveal any of the winners and losers. 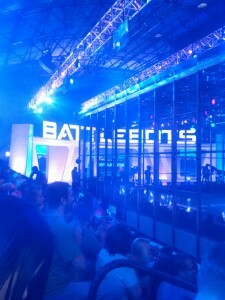 But I will say you need to watch Battlebots on ABC this summer, starting June 23rd, because there are some fun and epic things going on in those battles! Come on, you know you want to be a nerd, just like us! Besides, you just might see the four of us on national TV, screaming our brains out for the cameras! 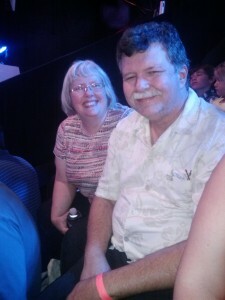 While Youngest Daughter’s friend was able to get us complementary tickets, it had nothing to do with this blog. 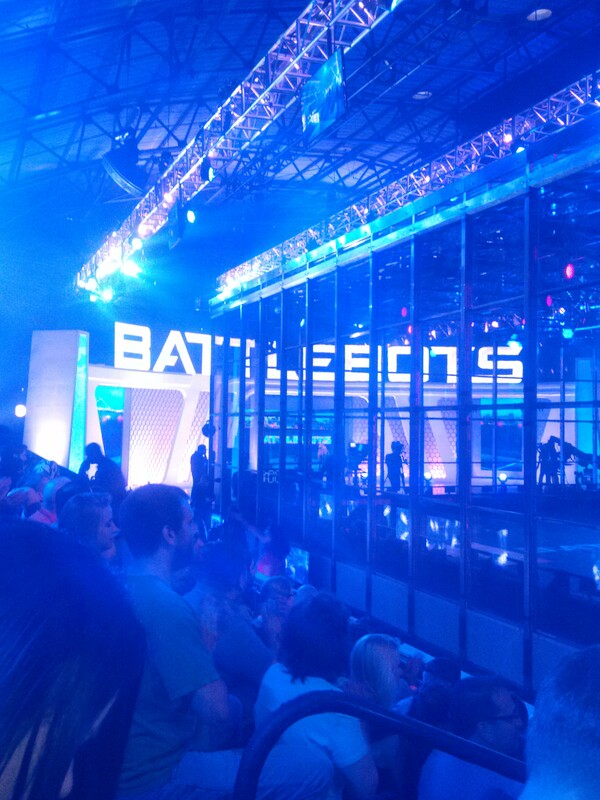 I wrote this post because, what the heck, why not tell you about my Battlebot experience? All opinions are all my own! You can tell this is one weird presidential election when actual candidates appear in my neck of the woods. California is a reliably blue state (at least most of the time) and so they usually only come to Los Angeles or Malibu or Silicon Valley to raise money. But Tuesday was one crazy day around here. Both Bernie and Hillary were here on the SAME DAY! Yep, they both appeared in the big city next door, in preparation for our primary in June. Bernie was at the municipal auditorium in down town. That messed with traffic patterns in that area. Hillary was at our local University of California branch. Unfortunately, Hillary decided to appear at the school the day Eldest Daughter had her second midterm. Eldest asked me to drive her as two parking lots were closed to students, to make way for the folks coming to see Hillary. I thought about going to see one of them. We don’t get this opportunity very often. However, when I considered what I would have to do to see either of them, I decided I would just read about it in the newspaper. Yep, this is going to be one crazy election season. Conk me over the head and wake me up in the middle of November, please! I consider that liquid flea and tick stuff you put on cats and dogs to be a miracle of modern life. I remember the flea baths and flea collars of the good old days. They only worked so well and it seemed like my pets always had fleas anyway, especially in the summer. The only problem we had is that Blackie and his brother Cheeks (who died nine years ago) always acted like the stuff burned their skin. We asked the vet office, and they said they had no knowledge of it hurting a cat or dog when it was put on them. Then we thought they hated it because it was cold. I would carry it around in my pocket to warm it up before we put it on them. Same reaction. Fast forward to 2016. I have been meaning to treat them with the miracle flea stuff. They don’t go outside, but the dog does and just to be on the safe side I thought I should dose them. However, I was reluctant after the reaction of my other cats all these years. Yesterday I put the liquid on the back of Nox’s neck. He couldn’t have cared less. Hum. Then I put it on Lumos. He reacted even less than Nox, if possible. That is when I had to face facts. 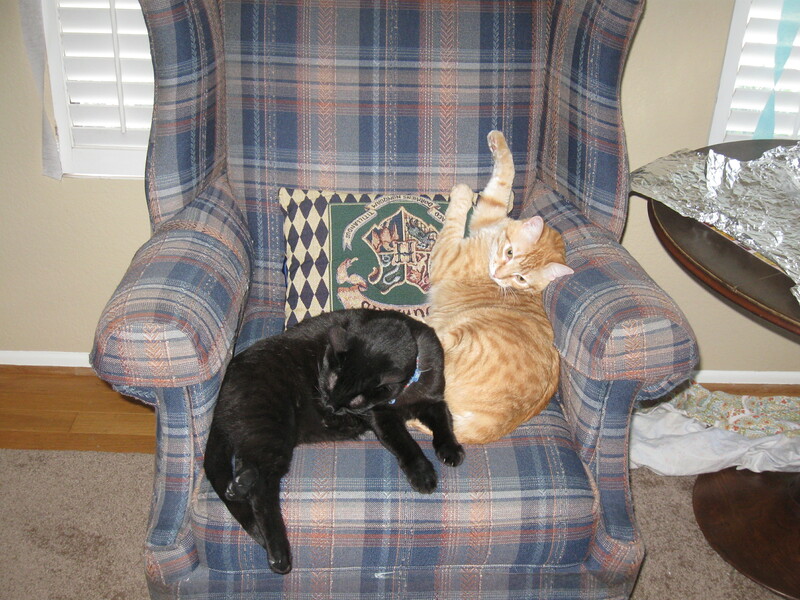 Blackie and Cheeks were drama kings. Maybe they had some weird, genetic tendency to have issues with the flea stuff, but I doubt it. Cheeks was a drama king and Blackie still it. It is good to finally know! 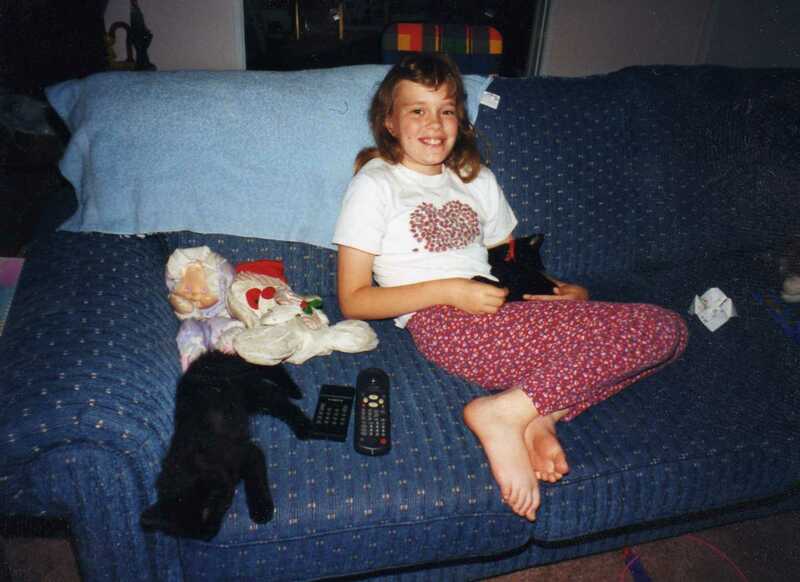 This is Eldest Daughter with Blackie and Cheeks as kittens. Long haired Cheeks is on the left, and Eldest is holding Blackie. They didn’t look like Drama Kings, but looks can be deceiving! An organization I belong to gave out its very first scholarship tonight. It was very gratifying to see something we have wanted to do for a couple of years come to fruition. It was even more gratifying because we have named the scholarship after a member of our organization who passed away. His family was there, including his wife, children and father, to see the scholarship being awarded. Because we were at a school function, we said the pledge of allegiance, and then a young woman got up and sang an acapella rendition of the Star Spangled Banner. I have got to tell you folks, when I am at a community function and a young person gets up and sings our wonderful national anthem, it gets me every time. I get emotional and I end up with tears in my eyes. Every. Single. Time. Last night was no exception! That note made me laugh. What a random little list of things. I must have made that list at the end of June, 2015. I was planning a little get together for Youngest Daughter and her friends to celebrate her college graduation (thus the need for party supplies) and I was dealing with the discovery of two tiny flea covered kittens. Oh, my life was in a tizzy back then!